We help you to sell your products. Cooperate Opportunities & Other Services. AllCAD is a leading developer of Windows based embroidery design and punching tools for schiffli machines. The company offers a complete set of integrated products for embroidery design, drafting and punching. AllCAD is committed to providing solutions of superior value to ensure our clients' success. AllCAD offers targeted solutions for the Embroidery Industry. Embroidery clients include companies, offering services for the Embroidery Industry and manufacturing companies serving this market. Cost effective Easy to use, rapid to deploy, modular licensing, low maintenance cost. Open built on Industry Standard Personal Computers running with WindowsXP or WindowsVista. The first competitive priority is to promote its flagship products ProArt & ProLace, which are fully integrated Embroidery Design and Punching Systems. 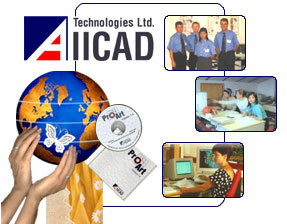 With this products AllCAD is capable to offer solutions for all embroidery development tasks. Second, AllCAD has recently released ProView 2, a powerful Embroidery Viewer, which allows to optimize the whole design development. Third, AllCAD is working with key customers and punchers to develop a strategy that allows AllCAD solutions to meet the needs of the single user, workgroup and enterprise. In fiscal 2007, sales in Europe accounted for 35% and Asia/Pacific accounted for 65% of the revenues.